According to a recent press release by Improper Books, their titles: Porcelain – A gothic fairytale, Night Post, Butterfly Gate and the newly added to the roster Mulp, are to be available digitally on Sequential, a comic and graphic novel app, available for iPad. Sequential works with publishers including Knockabout, Fantagraphics, Dark Horse, Top Shelf, SelfMadeHero, NBM, Secret Acres, Myriad Editions, and Blank Slate Books, as well as a number of small press publishers and creator-owned works. The Improper Books titles had previously been available only as hard copies, but since 14th October, they have entered the digital world as well. Since this was a special occasion, these titles can be bought at half-price until tomorrow, 19th October. Their latest book: Briar, by Benjamin Read and Chris Wildgoose will become available come the 21st of October. “We’re absolutely delighted to have partnered with Sequential to release these books digitally for the first time. 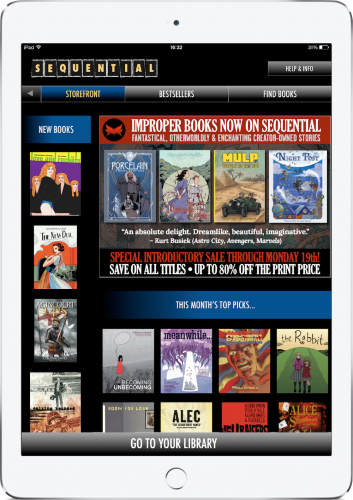 Sequential’s app and carefully curated line is truly impressive, and having been asked so many times by readers, it’ll be wonderful to finally have our books available digitally worldwide,” said Benjamin Read, one of the founders of Improper Books.